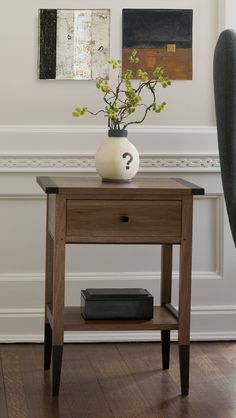 A master of clean lines and precise detailing, Dumke crafts this stylish end table from solid walnut or cherry, accenting the top and legs with dramatic wenge wood. Mortise-and-tenon joinery and pegged construction for stability. Metal pull. Dovetailed drawer. Lacquer finish.